In the past, Marker Limited has been known for developing iOS and Android applications, along with cloud services and API’s for websites, but Marker has recently made its way into the gaming world with their first ever home console game called Samsara: Deluxe Edition, which is available on Xbox One, Steam, and the Nintendo Switch. 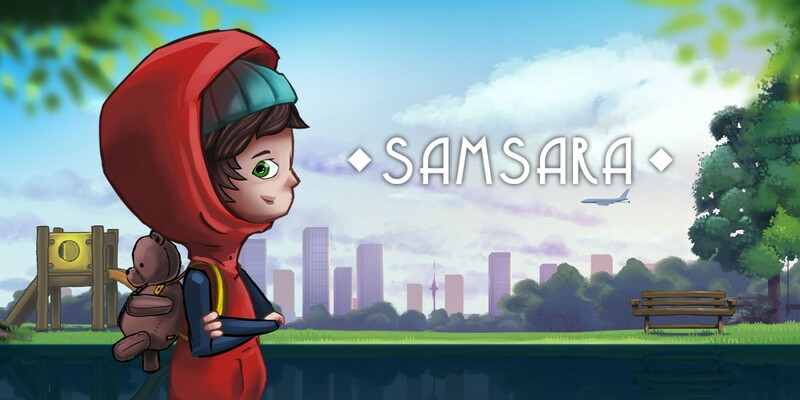 In Samsara: Deluxe Edition, a young boy named Zee follows a squirrel into a two-portal dimension called Samsara and your mission is to help Zee get out of Samsara. While getting Zee out of samsara may sound easy, players will need to navigate the game’s 77 levels, across six different realms and just in case that’s not enough places for you to explore, thanks to deluxe content on Switch, there are a further 24 levels and one new realm. Your goal in each level is to make a path using the given platforms such as stairs and blocks to get you and your shadow across to enter the portal. In the beginning, you will only have to worry about getting yourself to the other side of the level, but then a shadow version of you will appear and you will have to compromise to get both Zee and his shadow to the other side of the level. It may be challenging, but thankfully the game has a feature where you can inverse the level to see the level from the shadow’s side and inverse back to the original side of the level. Like most puzzle games, you are going to have to get creative and use strategic thinking to complete the level. At some points in the game, I had found myself having to come up with a strategy to achieve the level. At most times when I couldn’t find a way to complete it I would leave the game and then come back to the level and find myself finishing the level after letting my brain take a rest, so trust me when I tell you, you will have to use some brain power to get through some of the levels. Moreover, the controls are quite simple. The player uses the analog sticks to move and turn puzzle pieces and use the A button to put them into place. After you have filled all the empty spaces that won’t cause you to fall into the other dimension, you will press Y to test the level to see if you can make it to the other side. One slight thing I should mention is how quickly and how easy it is to mistake Y for A and vice versa, especially when playing with the Joy-Con. With the Pro Controller however, thanks to larger and defined buttons, there’s less hassle and it superior to just opting to play the game with the touch-screen controls to move the pieces around. Plus with a controller, you can benefit from HD Rumble. In addition to controls, the game’s visuals are stunning and feature an array of beautiful and vivid colors that spread throughout the levels and main menu of the game and even small moving details in the background of the levels really made the game a joy to play. Lastly, the soundtrack is simply magnificent and I adore the opening theme song and the track that plays when you’re playing through the levels and even at the beginning of the game. Overall, I enjoyed playing through Samsara: Deluxe Edition; it featured a lot of great elements throughout the playthrough of the game. The levels were challenging but satisfying to play. Although, I did get frustrated at times, I still was determined to complete the levels. While levels featured some significant challenges, the visuals and soundtrack made the game enjoyable to play. I didn’t expect the game to be as good as I initially thought it would be based on previous trailers. Other than that, Samsara: Deluxe Edition is a well around balanced puzzle game, and is a good fit for anyone who is interested in challenging puzzle/strategy games. For this to be Marker Limited’s first game they have ever developed for both console and PC, for it is an excellent puzzle game with a lot of great features.